Play, Sing, & Dance: An Introduction to Orff Schulwerk is a book that is perfectly described by its title. Published by Schott in 2002, author Doug Goodkin takes the entirety of the Orff Schulwerk experience and distills its essence into a book that both novice and experienced teachers can use to better understand the workings of the Schulwerk. This book begins with a two-part introduction. The first section describes the “majestic scope” of the Orff Schulwerk, its spread around the globe, and its core beliefs. The second section, “The Story of the Schulwerk,” highlights the critical historical events that led to the development of the Schulwerk and works to dispel some of the myths that have grown around Orff Schulwerk. Play, Sing, & Dance then begins in earnest. The rest of the book is divided into two major sections. The first, titled “Orff Media,” is a sixteen-chapter investigation into different methods of educating students. Beginning with chapters on playing, singing, and dancing, he then discusses the use of language, instruments, and drama in enhancing a child’s education. Each chapter is filled with examples of activities that are usable in a music classroom and describes the reasoning behind their inclusion in the realm of Orff media. The second section only has seven chapters, yet this section delves deeply into elemental music theory. Titled “Elemental Style,” this section explores how melodic, rhythmic, and harmonic concepts are presented to students in both the Orff Schulwerk classroom and the Orff Schulwerk teaching training courses. The “Volumes” are one of the core sources of musical materials in Orff Schulwerk, and Goodkin uses two chapters to explain them. The first chapter explains their history, development, and usage, while the second chapter describes their progression and the logic behind that progression. Doug Goodkin has this amazing ability to write just as he speaks; clearly, eloquently, honestly, and with just the right amount of humor. Using story-telling techniques and personal anecdotes, he makes the Schulwerk seem as approachable as an old friend. When I encounter a fellow music educator who is unfamiliar with Orff Schulwerk, this is unfailingly the book that I refer them to. 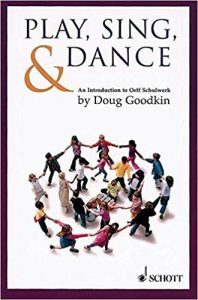 In Play, Sing, & Dance, Goodkin is able to not only explain the many different media found in the Schulwerk, but he also takes the time to weave the origin story and encourage those without training to go and seek out that training. I read this book both during my Levels training and afterwards, and I still find pearls of wisdom to enrich my professional or personal development. Thanks, Kate, for your generous review. Though of course I would change some things 17 years later, a recent re-reading revealed that it mostly holds up and that feels good. Hope others find it useful and stimulating. So glad to read this review. I have this book but never read it. You have inspired me to start reading it. This book looks like it’s right up my alley! creativity is so important when teaching kids. i will definitely check it out!